“That botany is a useful study is plain; because it is in vain that we know betony is good for headaches, or self-heal for wounds unless we can distinguish betony and self-heal from one another.” John Hill, The Family Herbal, 1812. Names are reference points, symbols — vehicles for communicating and distinguishing one thing from another. The nature of a person, place, or plant does not change because of its name. As Juliet reminds us, “What’s in a name? That which we call a rose by any other name would smell as sweet. . .”. Although the plant doesn’t care what you call it, people do. Confusion inevitably arises if simultaneously more than one name is applied to a person, place, or plant. Similarly, if the same name is given to several plants or persons over a period of time, ambiguity may persist. With a name like Steven Foster, I lived with quips about “my” songs, taking such comments with a smile and my standard response, “I haven’t written any songs for a hundred years.” What am I to say if someone asks if I’m the real Steven Foster? Yes, I’m real. But so was the other one. Recently, a user posted a picture of mayapples beginning to emerge from a Chinese garden in Portland, Oregon. She asked what the plant could be. It was Himalayan Mayapple! Beyond the identification and taxonomy, several genera in the Berberidaceae (barberry family) are among THE classic examples of disjunctions in plant geography. There are only two species accepted in the genus Podophyllum, including the American mayapple (Podophyllum peltatum) and an eastern Asiatic counterpart Podophyllum hexandrum (also known as Podophyllum emodi). In 1979 a Chinese botanist proposed a new separate genus and renamed P. hexandrum as Sinopodophyllum hexandrum. The most recent expert work on the plant group keeps the Chinese species as Podophyllum hexandrum. Taxonomy is like law — it is based on expert opinion (and there’s no taxonomic “supreme court”). There are several mayapple cultivars floating around in the nursery trade that have meaningless made-up names. Other small genera in the barberry family with only two to three species ALL have their closest relatives a hemisphere away! For example, in the genera Diphylleia, Jeffersonia, Caulophyllum (blue cohosh) there are only two to three species each and their closet relatives are on the other side of the world! The “interrupted Eastern Asiatic–Eastern North America range, involving up to 150 plant genera” is the classic series of disjunct populations in biogeography. 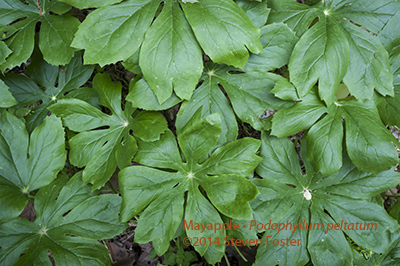 The resin of mayapple contains the toxic lectin podophyllotoxin which is used as the starting material for three anti-cancer drugs used in chemotherapy. Globally, the drug of choice for topical treatment of HPV (human papillomavirus) genital warts, also known as venereal warts are over-the-counter or prescription drugs (depending upon country and regulations) made from podophyllin resin. 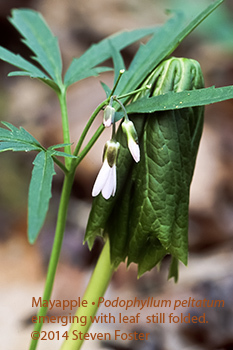 Most of the commercial raw podophyllin resin in world wholesale natural product ingredient markets comes from the Asian rather than American mayapple. Plant identification is always more than meets the eye. It bridges generations; past, present, and future; human diversity and continents!